For some odd reason CNN’s Jim Acosta—the same one recently banned from White House press conferences for rudely interrupting (genuine) reporters while pushing down the arm of a small female intern -- has been repeatedly welcomed with a red-carpet by the totalitarian Castro regime. Raul Castro’s Stalinist regime, by the way, is notorious for murdering, torturing, exiling and imprisoning (genuine) reporters for over half a century. But the only mentions of “dictatorships,” “suppression of freedoms”, etc. from CNN all refer to President Trump? But you’d never guess any of this from watching CNN’s voluminous reporting from their cushy Havana bureau. 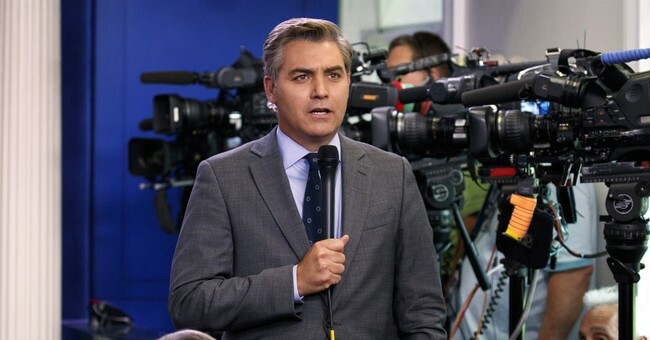 In fact CNN-- and more recently CNN’s Jim Acosta, whose father was born in Cuba-- have been treated like royalty by Cuba’s KGB-founded and mentored secret-police apparatchiks ever since 1997, when CNN was bestowed the very first foreign news bureau by the mass-murdering, mass-torturing, terror-sponsoring regime. Perhaps the Castro regime’s co-founder also sheds light on this matter: “Much more valuable than rural recruits for our Cuban guerrilla force were American media recruits to export our propaganda.” -Ernesto “Che” Guevara. Señor Botin-- in case you hadn’t guessed, amigos--was promptly booted from Cuba for refusing to play the same sniveling, cowardly game as CNN’s cowardly, cuckholded-- or perhaps even black-mailed--“reporters” play every time they file a “story” from Cuba. In brief, you’re not getting and keeping a Cuban journalist visa (much less a Havana Bureau) unless you shamelessly (and genuinely) collude with Cuba’s KGB-founded and mentored ministry of propaganda. This isn’t rocket science, amigos. Jim Acosta’s father fled Stalinist Cuba as an 11-year-old, while Raul Castro destroyed his homeland and shattered his family, same as the Castros — through mass-executions, mass-jailings, mass larceny and exile--shattered practically every family in Cuba. So you’d really think Acosta would aim some of the insolence he habitually directs at Sarah Huckabee Sanders and President Trump at the Cuban Stalinists. HA! Not a chance. In fact, while addressing the mass-murdering Cuban dictator during Obama’s visit to Havana in 2016, Jim Acosta’s nervous brown-nosing outdid both Eddie Haskell upon his every greeting of June Cleaver and The Scarecrow’s upon meeting The Wizard of Oz. Acosta’s shivering supplication to Raul Castro took place two years before his (attempted) third-degrees to Huckabee Sanders. So the contrast wasn’t glaring. Nonetheless, it was difficult for many Cuba-watchers to control their gag reflex while watching him during that trip. Raul Castro: You have the effrontery of asking me about political prisoners, you billowing bale of bovine fodder?! END OF STORY! That was IT, amigos. That future ROARING LION (!!!) of a Sarah Sanders/Trump interrogator and female intern-scuffler promptly tucked his wagging tail between his shivering legs, whimpered another “please” and “thank you” to “President” Castro (who everybody with half a brain knows keeps hundreds of political prisoners hidden from the Red Cross) shut up, and sat down. Several organizations including the Cuban-American National Foundation, Victims of Communism Memorial Foundation and the Center for a Free Cuba quickly compiled lists of Cuban political prisoners to present to Castro. But we are unaware of any follow-up by Jim “The Tiger!” Acosta with “President” Castro regarding the list of political prisoners or the Stalinist dictator’s pledge to promptly release them. It’s hard to envision Jim Acosta scuffling with a Castroite security specialist trying to shut him up. And the consequences would obviously differ dramatically from those at the White House. But the vision is still a fun one.